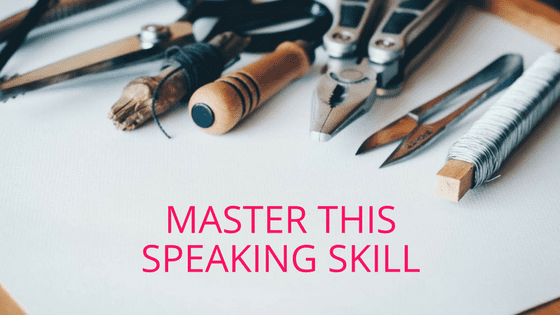 In part one of this four-part speaking success truth bomb series, I’m dishing on the number one skill that accelerates speaking success—speaking to the conversation in your audience members’ heads. Now, I want to acknowledge one of my mentors, Jonathan Fields, for this concept of the “conversation in the head.” During one of his trainings, Jonathan spoke about how this is the heart of writing great copy, and I realized it’s also at the heart of creating wicked transformation as a speaker for your peeps. Your audiences want nothing more than for you to make your ideas, personal stories, and recommendations relevant to them. If you’ve been speaking for any length of time, you know this. However, if you’re like most of the speakers I’ve worked with, irrespective of how long they’ve been speaking, you strive to create relevance with your content, which is a good start, yet you don’t go a step further and connect deeply with your audiences through the connective tissue that runs between all of your main points, sub points, examples, and so forth. Say exactly what you think people are thinking in a given moment. Show that you have similarly thought, felt, or acted the way you know your audience has—and that you survived and they will too. Give people permission to shift by naming where they are—and showing them where they want to (and can) be. Speaking to the conversation in your audiences’ heads lets you demonstrate your credibility, engender trust, facilitate deep connection, counter objections, and move people to take big action—in the world (and with you!). And the most impactful speakers, they speak this directly with their audience members throughout a presentation. Is it scary to be that real and raw? You betcha—and it’s also insanely satisfying and fun. So, the next time you want to move an audience member, a current or prospective client (or even a romantic partner (or child!) to take action), think about what is going on in his, her, or their heads, and speak it aloud. And be sure to subscribe below so you don’t miss parts two through four of my speaking success truth bomb series, dropping every few days over the next couple of weeks.